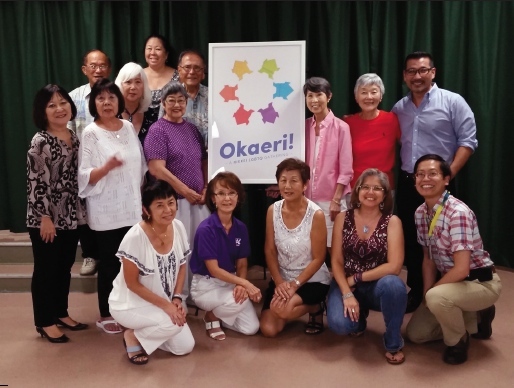 On the last Sunday of last month, a pre-Okaeri panel was presented at the San Fernando Valley JA Community Center. 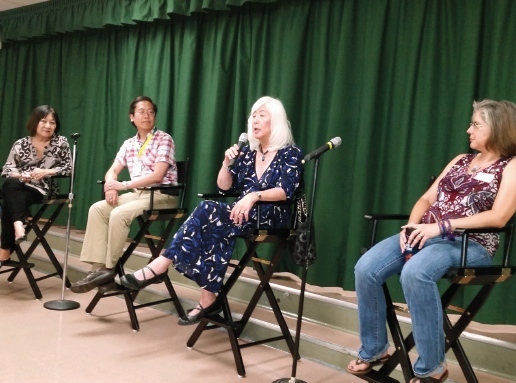 Moderated by long-time activist Marsha Aizumi, the panel presented Jason Takagi, head of information technology in San Luis Obispo, and Mia Yamamoto and her wife, Kimberlee Tellez. Mia and Kimberlee were married a year ago after the historic Supreme Court decision that made this possible. This event was held as a prelude to a Okaeri gathering taking place this year on Oct. 14 and 15 at JANM. The first Okaeri was held at the Japanese American National Museum two years ago. From left: Panelists Marsha Aizumi, Jason Takagi, Mia Yamamoto, Kimberlee Tellez. Jason knew he was gay at a fairly early age, and his coming out to his family was relatively smooth. He grew up in a white community, so interfacing as a gay man in the JA community was not an issue. The Methodist church where he grew up was fairly progressive, and as a young adult he was able to influence his congregation to declare itself “reconciling” — open to and welcoming LGBT persons. 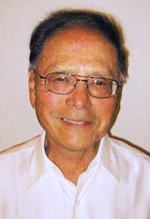 Jason presently serves as convener of Reconciling Ministries for the California Pacific Conference of the United Methodist Church. Mia’s journey in becoming a female came when she was a young adult. Most of her family members were accepting of her as a trans female, but an older brother rejected her, and to this day has not spoken to her. In spite of this, to her credit, Mia does not hold this against her brother. When Mia came out, she was working as a defense attorney for L.A. County. She felt an obligation to tell her clients of her transformation and give them the option of finding another attorney. To her pleasant surprise, none of her clients decided to leave her. Kimberlee’s father is Mexican American. Her first hurdle was gaining acceptance in her family as a lesbian. Then, when she told her family of her decision to marry Mia, her father, being Catholic, was opposed to her marriage taking place outside the Catholic Church. Her family has now come to accept the marriage. An interesting part of the adjustment in their marriage had to do with what Kimberlee took for granted. It involved a certain feminine way of handling cookware that she had to explain to Mia. Panel participants and San Fernando Valley JACL Board. First row, from left: Barbara Okita, Linda Tanaka, Nancy Gohata, Kimberlee Tellez, Jason Takagi. Second row: Marsha Aizumi, Doreen Kawamoto, Sumi Yamaguchi, Mitzi Kushida, Marion Shigekuni, Eric Arimoto. Third row: Harold Kameya, Mia Yamamoto, Nancy Takayama, Phil Shigekuni. At the conclusion of our meeting, Eric Arimoto, a gay family counselor, spoke briefly of his journey. Although his family was accepting of him as gay, relating to others in the JA community was a challenge. Feeling rejected by the JA community, he joined the Army. Eric told of how meaningful the Okaeri gathering two years ago was for him. It was, indeed, a time for him to come home to his community. The day after the panel, while exercising, I happened to see on the next street a Shin-Issei man I have known for a few years. He asked me how the previous day’s meeting went. I told him it was too bad that he or his family did not attend. He commented, “My boy is too young to hear about such things.” I asked him how old his son is. His answer: “52.” It caused me to wonder how common it is that there is a need for JA families to shield their children from the LGBT community. As mentioned above, our Okaeri gathering will be held on Oct. 14-15. Judging from the gathering two years ago, it will be a time of coming home for those who have been estranged from their families, and from our community. You are welcome to come to hear their stories and give them the support they would surely welcome. For more information, visit www.okaeri-losangeles.org/.